Julius & the Watchmaker is the first novel by Melbourne author Tim Hehir. It is a Young Adult Sci-Fi adventure set in Victorian London in 1837. It is suitable for kids aged 12-18 who enjoy science fiction stories with imaginative history thrown in. This is the first story I have read that can be classed as steampunk. According to www.urbandictionary.com, steampunk refers to a subgenre of speculative fiction usually set in an anachronistic Victorian or quasi-Victorian alternate history setting. Hehir’s style is fast paced and action packed. He plays with some fascinating ideas of time, time slips, travel, vortexes, time jumps into possible time lines, alternate futures and dimensions. His love for classics can be seen in his references to Dickens, Austen, Byron and Shelley. Three themes that come through are the effects of greed, control and the fight for survival. Hehir’s main character, Julius is a reluctant hero who is initially the target for Crimper McCready and his gang of school bullies. Julius is not the sort of character who is actively looking for a wild adventure. He helps his grandfather by delivering books from his second-hand book shop, Higgins’ Booksellers in Ironmonger Lane. His main objective is to keep out of trouble. But Julius’s life changes when the villain, Springheel appears at the book shop enquiring about a mysterious diary written by John Harrison. Springheel stands up to Crimper McCready with an obvious sense of power. Julius is impressed and wants to learn the secret to this power. From there Julius is drawn into an unexpected and sometimes scary world of time travel, alternative realities, vortexes, doppelgangers, flying machines, Grackacks, ruffians and mayhem- all centred around the workings of a magical spinning pocket watch. Julius finds himself caught between Springheel and his offsider Clements and Professor Fox and champion boxer, Mr Flynn. Springheel and Clements are out to manipulate time and to control London and the world. Professor Fox is part of the Guild of Watchmakers who are the guardians and their aim is to protect the timeline from manipulation by criminals and rogues like Springheel. 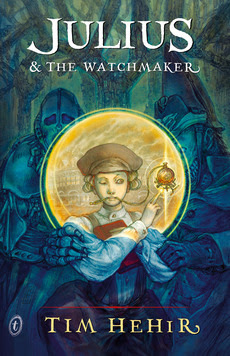 Julius & the Watchmaker captured my imagination and I found it to be an engrossing read.